Pakistan HVACR Society is an associated society of ASHRAE (American Society of Heating, refrigeration and Air-Conditioning Engineers). Knowledge dissemination and experience sharing related with Heating Ventilation, Air-Conditioning and Refrigeration is its prime goal to achieve. 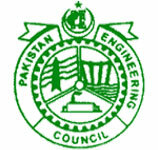 The Pakistan Engineering Council is a statutory body, constituted under the PEC Act No. V of 1976. The council shall encourage, facilitate and regulate working of professional engineering bodies as learned societies for creativity and custodians of technology under the umbrella of the council.